At the Nederlander Theater on 41st Street, Million Dollar Quartet is attracting enthusiastic, albeit heavily discounted, audiences of rock and roll faithful to witness a recreation of a mythic night with four rock icons. Thirteen blocks north, at the Studio 54, Sondheim on Sondheim is holding court to a similarly enthusiastic, and discounted, audience of acolytes to the cult of Stephen Sondheim. While both shows have their respective merits, both are also ultimately for fans only. Sondheim on Sondheim began its life with the unimaginably twee name of iSondheim, and is compiled by James Lapine, longtime Sondheim librettist and director. Lapine wisely opts for a thematic exploration of Sondheim's oeuvre rather than a staid "and then I wrote" format. The songs emerge from video discussions with the man himself, and offer interesting, if somewhat superficial, glimpses into the great man's life and creative process. For instance, the song "Franklin Shepherd, Inc." from Merrily We Roll Along emerges from a discussion about the breakup of Sondheim's working relationship with director Harold Prince. After Sondheim reveals that he didn't have a serious romantic relationship until he was 60 years old, we get "Happiness" from Passion, which here becomes an amusing bi-curious daisy chain of love, requited and otherwise. And, although many people have assumed over the years that various aspects of Sondheim's work have been autobiographical, Sondheim insists that the only truly autobiographical song he ever wrote was "Opening Doors" from Merrily, which he says was about his early professional experience, as well as that of Mary Rodgers and Sheldon Harnick, during the 1950s. The video anecdotes feature many of the same tales that Sondheim aficionados have heard time and again. (e.g. How "Comedy Tonight" supposedly saved A Funny Thing Happened on the Way to the Forum single-handedly, and how Sondheim wrote at least three different songs for the finale of Company before settling on "Being Alive.") But there are also some interesting and instructive tips on song writing. At one point Sondheim explains the difference between lyrics and poetry: a reader can go over poetry multiple times to find shades of meaning, whereas a song lyric needs to work on a first hearing. The video screens also offer opportunities for apt scenic touches, including footage from the original "Passione d'Amour" movie, and a stunning array of assassination victims (including Harvey Milk and Benazir Bhutto) during "The Gun Song" from Assassins. The video narration gets a bit ponderous at times, including some rather banal insights about how producing art is like having children, and about teaching being a sacred profession. 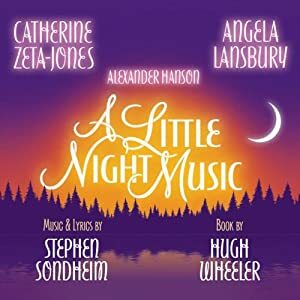 But other video moments work quite stunningly, mostly those concerning Sondheim's strained relationship with his mother (who seems a rather horrid human being, at least based on the information in the show), as well as his bond with his substitute paternal figure, the great Oscar Hammerstein. This mother/father sequence features some rather shocking revelations and sweet reminiscences that I won't recount here, but this part of the show alone makes it well worth seeing, at least for the musical-theater faithful. The cast of Sondheim on Sondheim features an awkward trio of admittedly talented headliners, although it's really not clear how they belong in the same show. Vanessa Williams was lovely and professional, but didn't really make a lasting impression. I felt rather sorry for Tom Wopat, a talented guy who here is saddled with the most ill-fitting song choices, including "Finishing the Hat" and "Epiphany," which didn't seem to have sufficient setup or purpose when I saw the show in early previews. Thankfully, the glorious Barbara Cook is always a pleasure to witness. Although her top notes are pretty much gone (hey, she's 82, for frig's sake), she still exhibits remarkable vocal control. Heck, I'll take attenuated Babs over the current crop of screaming Broadway belters any day. As she sang "Buddy's Eyes" from Follies, I took great pleasure when she got to the lyric "I'm still the princess. Still the prize." Yes, you are, Barbara. Yes, you are.